Now available, from Amazon, Barnes & Noble, or an independent bookstore near you. Signed prints available in my online store. Download a free teachers guide. Q and A with Chad Finn of Boston.com, on the Touching All the Bases blog. Here's an interview I did with the Smart Books for Smart Kids blog. And this one I did with Sports Illustrated Kids. I chatted with Rob Caldwell about Growing Up Pedro on 207. Before Pedro Martinez was elected to the Baseball Hall of Fame, before he pitched the Red Sox to a World Series Championship, before he was named to the All-Star team eight times and won the Cy Young Award three times, he was a kid from a place called Manoguayabo in the Dominican Republic. Pedro loved baseball more than anything, and his older brother Ramon was the best pitcher he'd ever seen. He dreamed of the day he and his brother could play together in the major leagues. This is the story of how that dream came true. Matt Tavares has crafted a fitting homage to a modern-day baseball star that examines both his improbable rise to the top of his game and the power that comes from the deep bond between brothers. "Tavares masterfully depicts, with quick verse and beautiful illustrations, the world in which the two siblings came of age.... A wonderful introduction to a truly special player." "Tavares's luminous paintings pair with accessible prose arranged into verse-like passages to create a vivid portrait of two contemporary athletes." "The gouache and watercolor paintings lovingly depict both players, from boyhood to adulthood. Tavares captures some of the iconic images of Pedro: pitching with intensity, goofing off in the bullpen, and even being taped to a pole by his teammates as a prank." 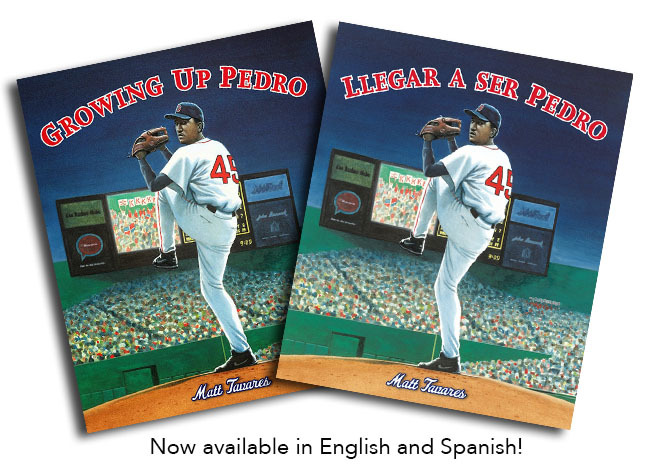 "A must own picture book biography"
"Growing Up Pedro is excellent! Stunning artwork, layout, design and narrative." "More than a book about baseball, it is a story about brotherhood, determination, overcoming obstacles, and dreams come true." 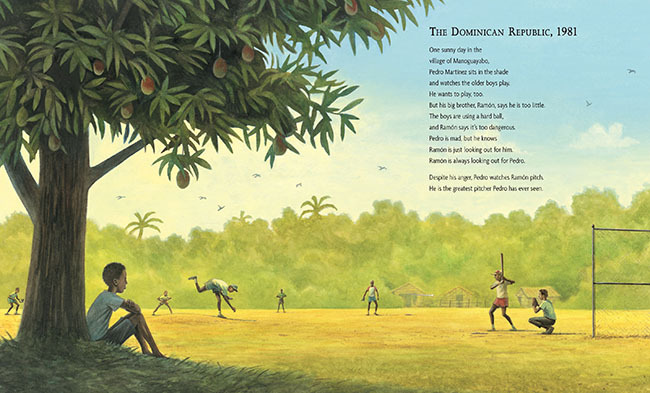 "The paintings that illustrate the text- both precise and soft- capture the texture of life in the Dominican Republic, but also manage to evoke the iconic images of Pedro on the mound..."
"Matt Tavares' meticulous and beautifully-wrought illustrations beckon the reader to slow down and take in the details." "It's not just a story of baseball and brotherhood, but one of hard work, hometown pride, self-confidence and determination. Given that this book has done what I could not -- it helped my kids appreciate Pedro, and on a level beyond his accomplishments -- I cannot recommend it enough." "It's a sweet family story;... Matt Tavares has imbued it with a warmth and hopefulness and, by showing the early makings of a baseball legend, he makes it much more than just another profile of a Hall of Famer." "Matt Tavares's illustrations command attention. The soft colors of his landscapes suggest sunshine diffused by tropical humidity. Mountains draped in lush vegetation fill the backdrops of the Dominican scenes. In the second part of the story, Pedro's world switches to baseball stadiums packed with cheering fans, dressed in Red Sox team colors. 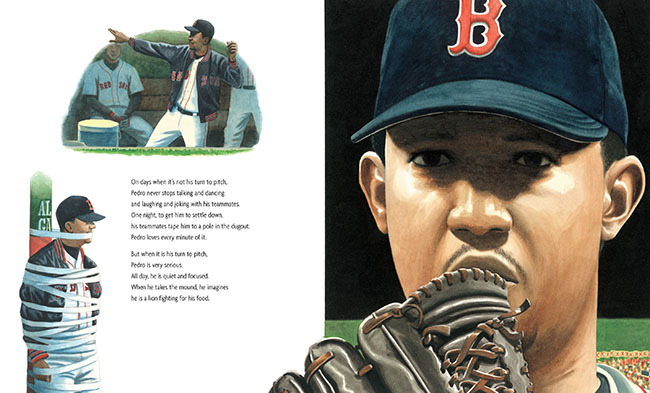 One powerful illustration zooms in on Martinez's face as he stands at the pitcher's mound. His eyes contain supreme focus and reflect years of devotion to his sport."